Why Should You Opt For Laser Marking? Home > Blog > Why Should You Opt For Laser Marking? Today’s vehicles, machineries, and equipment are so complex that they have enormous lengths of cables running through them to provide a complete electrical system. All these cables are different in length, type, and function, which makes it difficult to identify one single cable when required. Also, it makes it difficult to maintain, repair, and replace one single cable when the situation arises when so many hundreds of cables run through the space. This is why laser marking has come as a boon to such situations, where it provides accurate descriptions of what each single cable is about. But, why only laser marking? There are many other marking and printing methods that can make cables identifiable. So, what is it that makes laser marking the best out of the lot? Laser marking permanently marks the insulation material that wraps around the cables. The marking machine consists of a metal disc with cutouts of whatever numbers, letters, and symbols need to be printed. For every character, the disc spins to the required position and the laser lights shines through it onto the cable in the shape of the cutout. The laser light reacts with the titanium dioxide in the insulating material, which changes its colour to a darker tone, leaving behind a permanent mark. One can print any kind of information onto a cable with the laser marking method. It could be information about the product, the manufacturer’s the cable’s function, the standard of the cable, or any other information required. Laser marking doesn’t damage the cables. Other methods like hot stamping presses a hot mould coated with pigment onto the cable’s insulation material, which ultimately damages the structural integrity of the cable. Any such damage can cause problems, especially when the environment these cables are to be used in is humid, moist, or prone to fluids or any other contaminants. Laser marking is the fastest among all other marking methods. It can mark hundreds of cables quickly and effectively, while leaving a permanent mark and no damage to the cables. Laser marking is highly accurate as compared to other marking methods; there are very fewer pieces that can go wrong in the process. Today, thinner gauged cables are used to create complex electrical networking systems to reduce the excessive bulk weight that can be caused if multiple generally used cables are used. Laser marking adds to this benefit of not adding extra weight as it can mark these thinner cables effectively. Such thin cables may not be able to handle the pressure or tension given to them by other marking methods. All in all, laser marking proves to be a superior method for marking cables quickly and effectively. 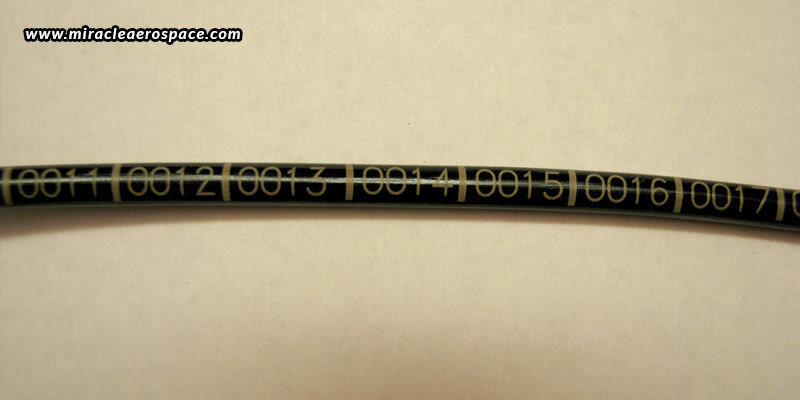 So, the next time you are thinking of marking your cables, think about laser marking. And, you can have your cables marked by Miracle Aerospace, the leader in laser marking for aircraft cables. However, we can also mark any other kinds of cables used in any other application, no matter what the material, size, length or print specification.